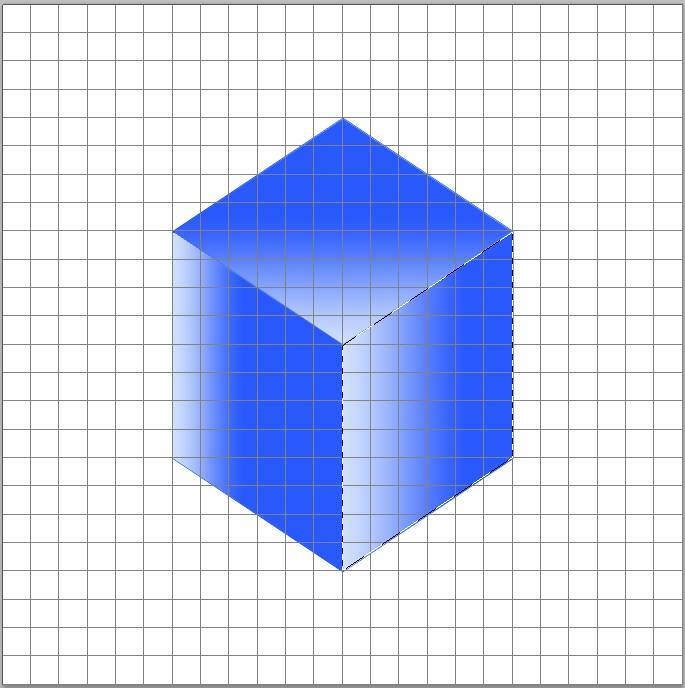 In this tutorial, you will learn to make Cube primitives in Photoshop. 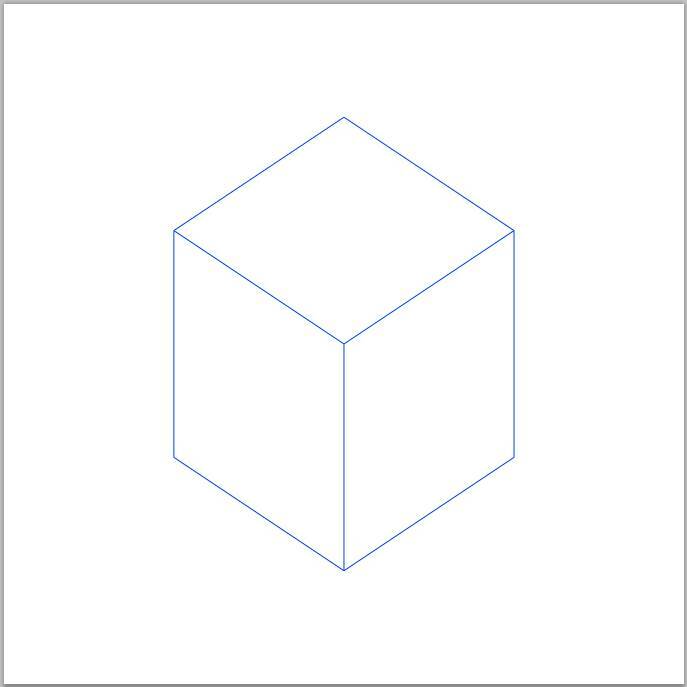 You could hand draw and paint a cube if you are a good artist, but by using gradients and outlines, you can create realistic images with depth. 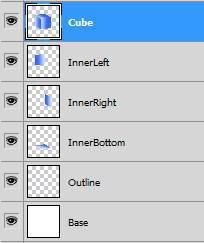 To make the Cube, just the Line tool is used to create the outline. Use the Magic Wand tool to select the three side areas. Put a Linear Gradient on all three sides to bring out the depth. 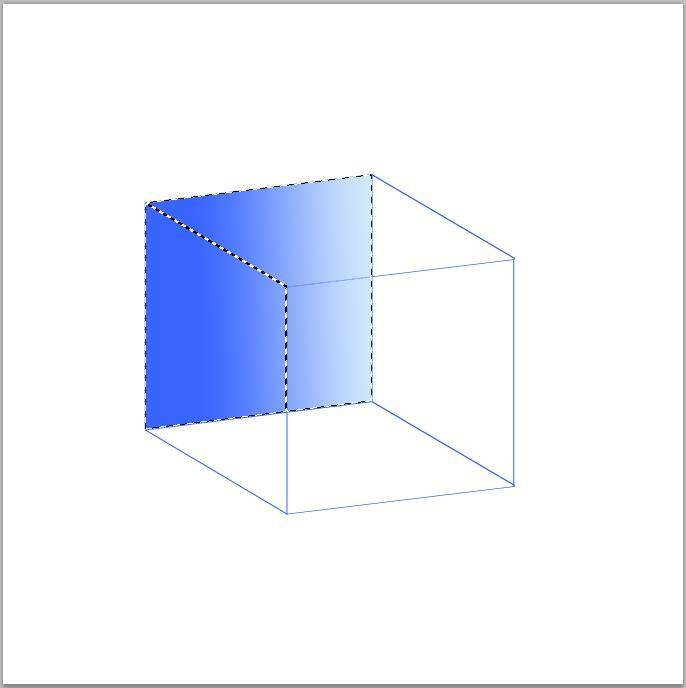 The transparent version uses four layers of Linear Gradients in different directions. The Opacity is turned down on all four layers to bring out the transparency and depth. Open a new project 24x24cm square, and fill with white. Name it Base. Create a layer above it called Outline. Change the foreground to blue. 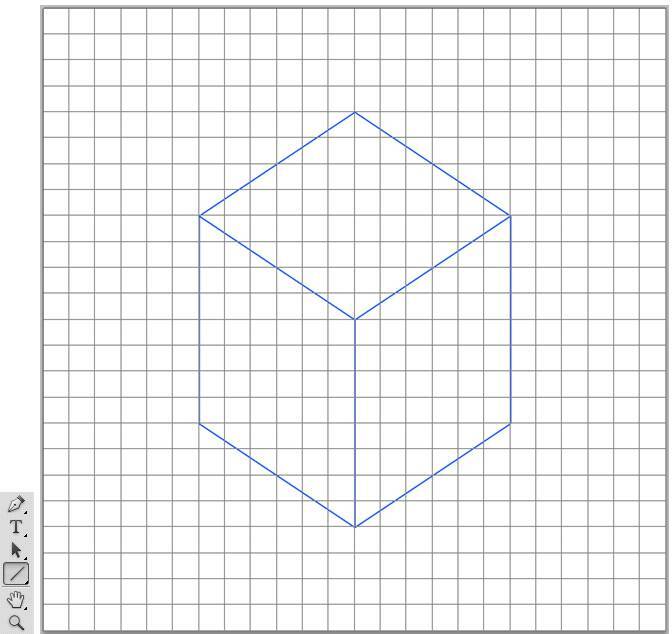 On the Outline layer, make the outline of a cube using the Line tool, pixel size=1. Click the Gradient Tool. Then Linear Gradient. 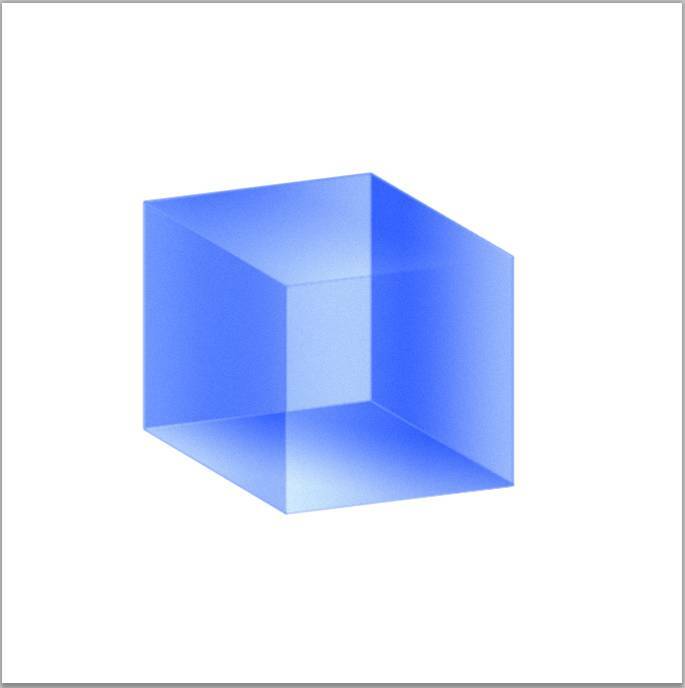 Use the Magic Wand to select the top of the cube. Drag the mouse upward to create the gradient below. 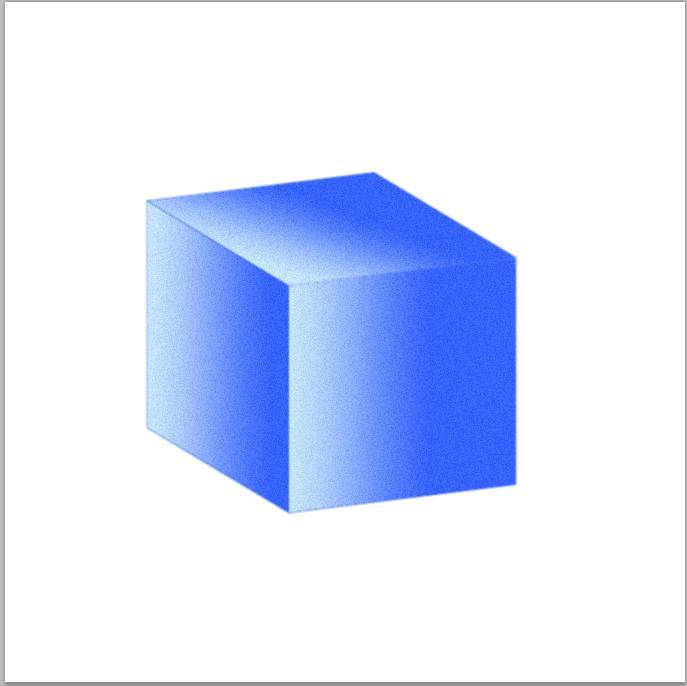 Use the Magic Wand to select the bottom left of the cube. Drag the mouse to the right to create the gradient below. 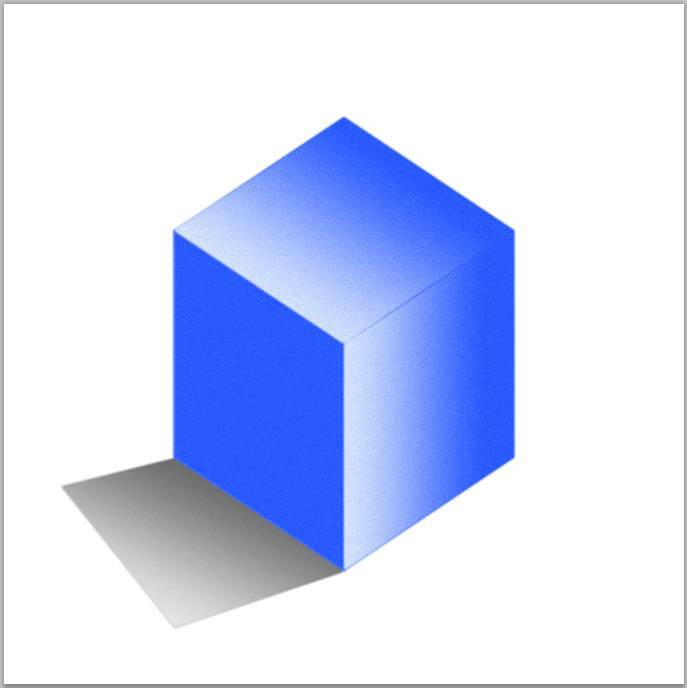 Use the Magic Wand to select the bottom right of the cube. Drag the mouse to the right to create the gradient below. On the Outline layer, go to menu, Filter/Blur/Blur More. Then to Filter/Noise/Add Noise. Turn off the Grid. Use Linear gradient again on the top and right sides. Then use the Bucket tool to fill in the left side with blue. Remember toFilter/Blur/Blur More. Then to Filter/Noise/Add Noise. Turn on the Grid. 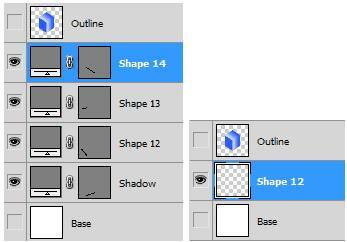 On the Shadow layer, the use the Line tool(color light gray) to draw the shadow outline. 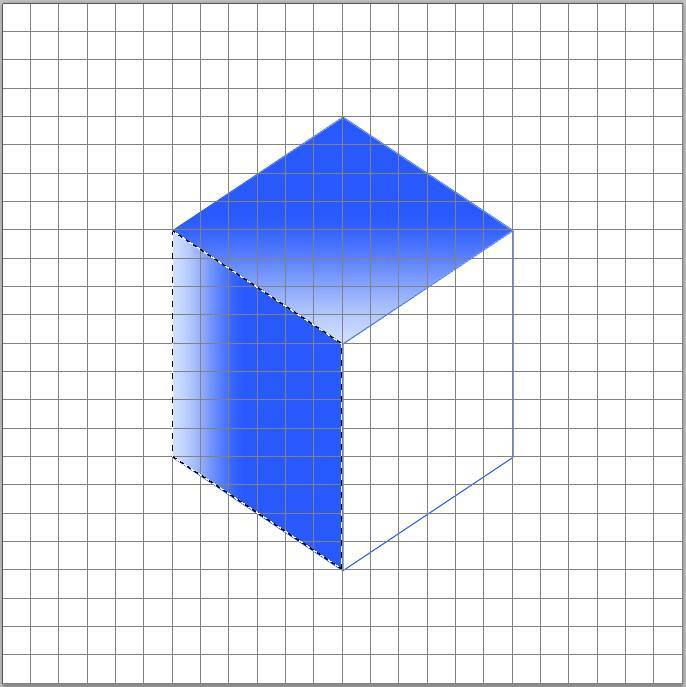 Merge the visible shape layers. Change the gradient to a black to grey one. Choose Linear Gradient. Stay on the Shadow layer. Use the Magic Wand to select the shadow area. Draw the gradient inside the shadow selection. Go to Filter/Noise/Add Noise. Now to Blur the Shadow layer. Go to Filter/Blur/Blur More. Bring down the Opacity of the shadow layer until it looks right. Create an Outline layer and a Base layer. 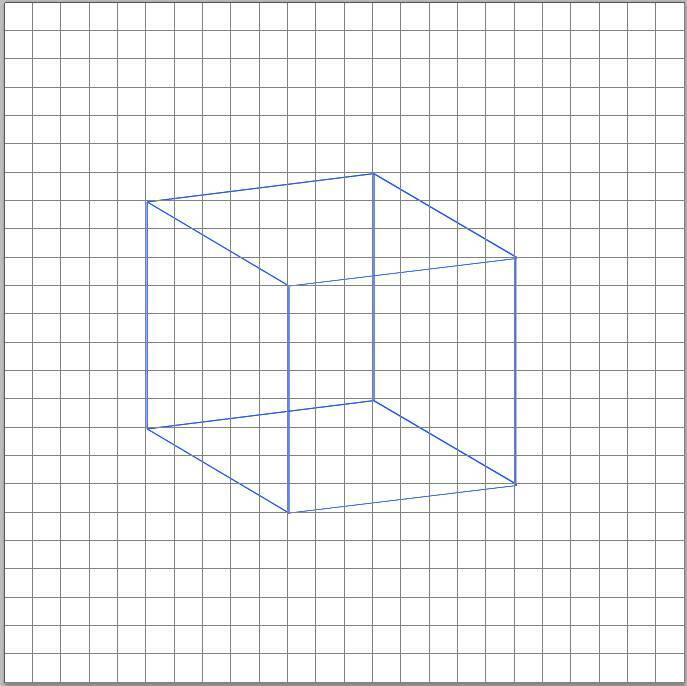 Create a new outline of a cube. 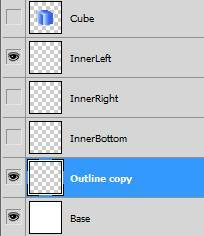 Make a Duplicate copy of the OutLine layer. 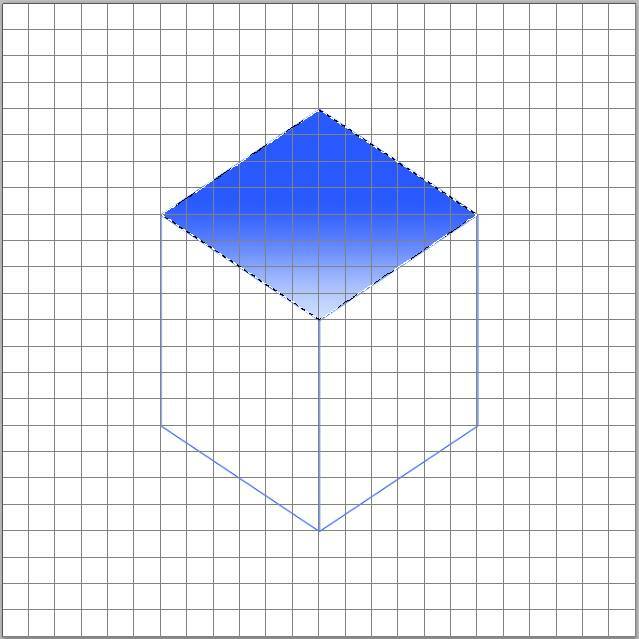 Stay on the Outline layer, and put blue Linear Gradients on it just like the first example. Blur and add Noise. Rename the Outline layer Cube. 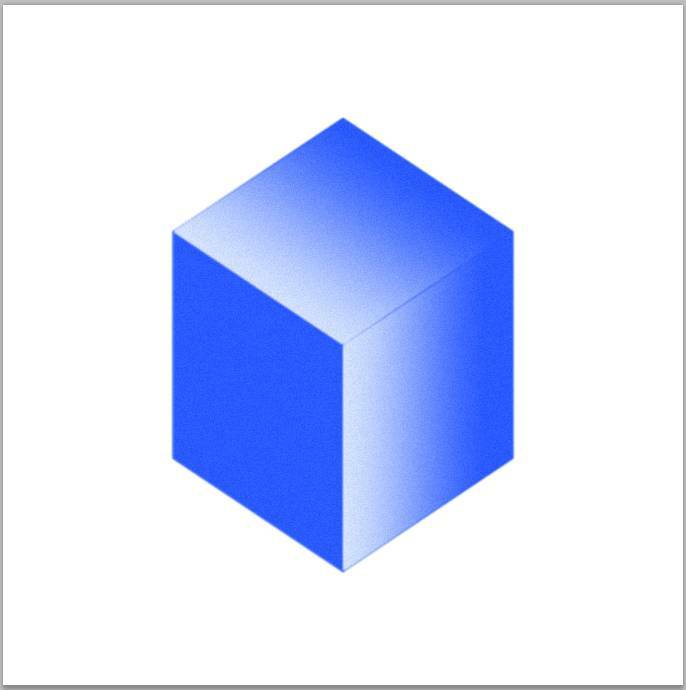 Turn off the cube layer. Go back to the Outline copy layer. Use the Magic Wand to click the three areas that make the inner left side. 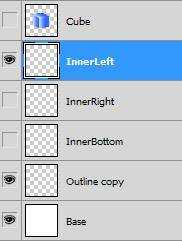 Now go to the InnerLeft layer. With the selections still on, create a Linear Gradient like below. Go back to the Outline copy layer… Select the areas that make up the InnerRight layer… go back to the InnerRight layer and create a gradient. 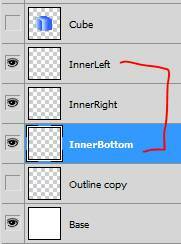 Follow the same steps for the InnerBottom layer. Blur the InnerLeft, InnerRight, InnerBottom and Outline layers. 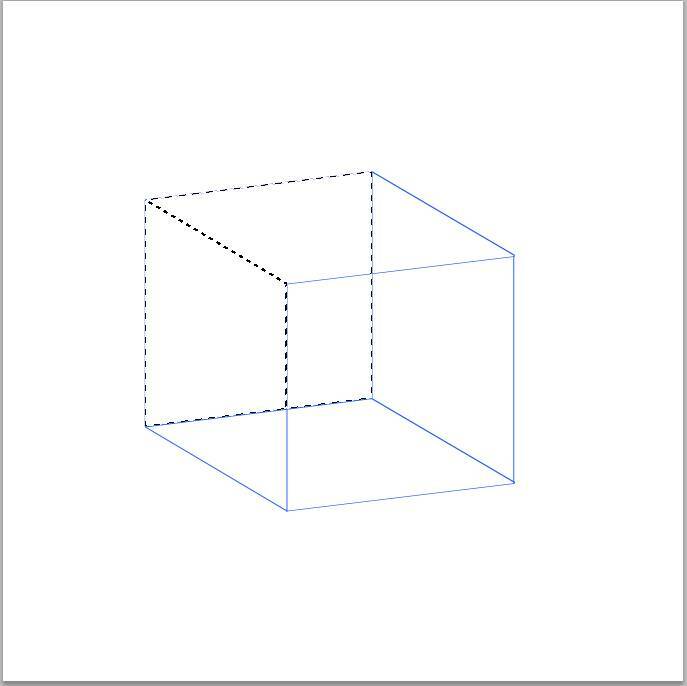 Turn on the Cube layer and drop the Opacity until it looks like below.